Enemies: Anton Invaders of Korpu (Marvel Mystery #19; Electro foe), Green Terror (Marvel Mystery #15; Electro foe), Onees (Marvel Mystery #14; Electro foe) - subterranean race who seeks to destroy life on the surface. Powers/Abilities: Superhuman strength. Immune to weapons up to and including cannon fire. Able to leap miles at a time, and to run at faster than 100 miles an hour. Able to detect radio waves, allowing the Operatives to summon him when needed. Electro could also project images around the area of his "face" - usually the Professor used this trick to communicate with the Operatives. 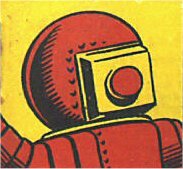 History: (Marvel Mystery Comics #4-19, ga) Wishing to help mankind, wealthy genius Professor Philo Zog designed a super robot which he dubbed Electro. He then recruited a team of special operatives whom he sent out to locate crime and fifth columnists, each armed with a special wireless phone capable of summoning Electro. 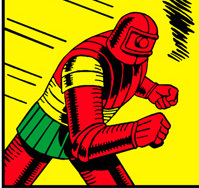 (The Twelve) In 1945 Zog remote piloted Electro to assist in the Battle of Berlin, but the robot was captured alongside several other heroes. His link to the robot abruptly cut off, Zog died, but Electro was discovered decades later, and reclaimed by Zog's daughter. Comments: Electro was seen in the modern era on the cover of a newspaper in Marvels #1. Although he didn't actually appear, this confirmed that a version of him does exist in the current Marvel universe. He subsequently reappeared in The Twelve mini-series.